Beautiful photo, PG, especially when clicked to make larger. Peaceful somehow. Thank you. 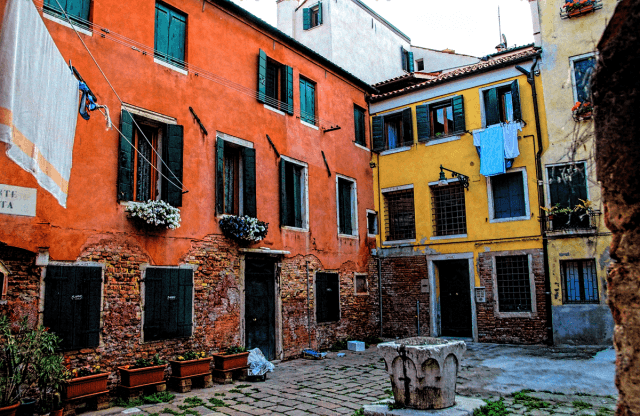 I’ve noticed in pics of Venice, those things in the middle of the courtyard. Are they water fountains? They used to be, yes! They’re no longer used for that purpose. All the ones I saw were covered up because otherwise people would use them as trash cans. Beautiful, but just one shot? There are lots more. Every time you turn around in Venice, you see another great photo. Thanks, PG. Such cheerful colors. I’d love to see more of your time in Venice.